"Beals is the maddest freak that ever landed in Saint John. His lips are as large as those of an ordinary cow and when he laughs there is an opening which could easily take in the end of an ordinary square loaf of bread." EVERYBODY in Dartmouth knew Edward (Sky) Beals. That's why people noticed when he went missing in 1896. Rumours flew that Sky had joined a circus sideshow. The man, who claimed he was born in Africa, had been exploited before. 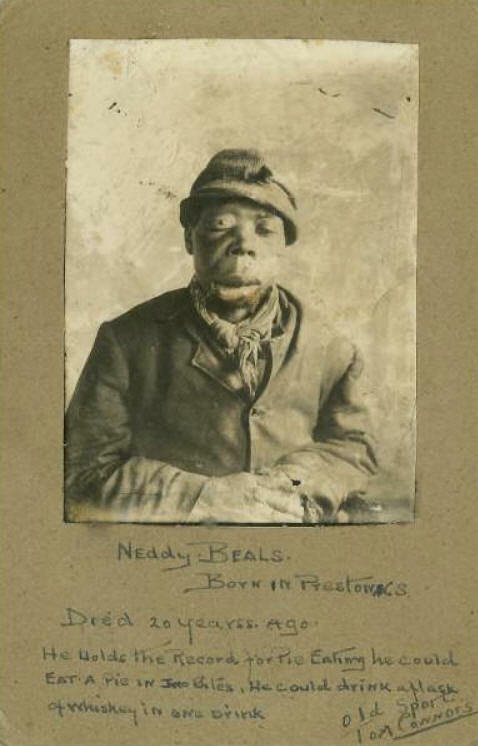 A photo of his face had been used for a postcard labelled, "Ten cents a kiss." 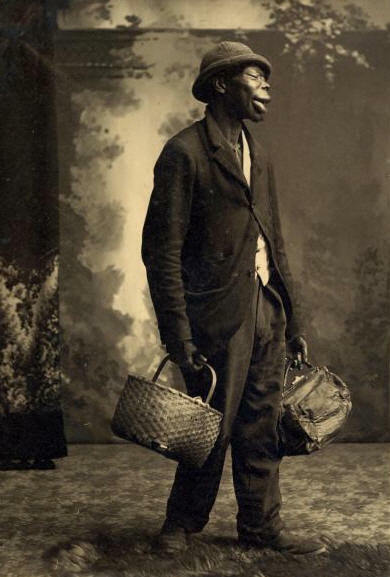 That was considered funny a century ago, a time when people with deformities or unusual appearances were exhibited in travelling circuses known as freak shows. Sky Beals was often seen at the Halifax market where Preston residents sold mint, herbs, wild cherry bark, berries and mayflowers, along with handcrafted rustic chairs and benches. By all reports, Beals was a gifted singer who could earn some coins by singing his favourite hymn, Roll, Jordan, Roll. Sky hadn't joined the circus. But he was indeed on a summer tour with an upstart travelling variety show. The theatrical venture was the brainchild of a young Dartmouth impresario named Charlie McNellen. McNellen had a history of failed get-rich-quick schemes, including a fruit stand at the Public Gardens. But Charlie's grocery career was brief. He retired soon after an unpaid supplier punched him senseless. Charlie pressed charges against his assailant and won a $6 settlement in police court. Charlie's fancy then turned to love his love of money. He began courting the 17-year-old daughter of a wealthy Halifax family. His $6 was enough to lavish a few days of big spending on the girl. The smooth-talking Charlie convinced her that he had inherited $10,000 from a Boston relative, but the couple was intercepted by constables in Sackville, N.S., as they attempted to elope. Eventually, Charlie resolved to give up his reckless lifestyle and show some adult responsibility. That's when he quit his job at a local rubber stamp company and started his very own freak show. Charlie recruited some local talent, including a boxer and piano player. Sky Beals would be his star attraction. Charlie fitted Sky with a calfskin costume and billed him as the man-faced calf. A Shelburne resident he nicknamed "Pig-face" rounded out his human ensemble. Charlie also had a bizarre collection of stuffed animals and a few live rabbits without ears or legs. Some colourful posters were printed and the troupe went on the road. Surprisingly, Charlie had a hit on his hands. In Truro, the likeable Beals was a popular attraction. News of Sky's show business success made its way back to Dartmouth. For once in his life, Sky had a good income and was eating well. He was delighted to be christened "noble-jaw." The dime show stayed profitable as it passed through Amherst and into New Brunswick. After appearing in Moncton, the odd menagerie attracted large crowds during a week-long stand at an uptown store in Saint John. But in McAdam Junction near the U.S. border, the show started to fall apart. Nobody cried when the piano player quit. Even after the boxer split, the show still had promise. But it was curtains for the McNellen Variety Show when an angry taxidermist repossessed a two-headed chicken. Showman Charlie disappeared, leaving Sky and Pig-face to fend for themselves. Beals found himself back in Saint John wandering the streets followed by a constant horde of boys. Beals couldn't understand why his pay wasn't accepted by Saint John merchants. To his way of thinking, his $10 bill was as valuable as anyone else's money. But it wasn't. The sly Charlie had paid off Beals with a worthless ticket from the Louisiana lottery. Beals quickly found himself under arrest and a guest of the Saint John jailhouse. He was released and began walking back to Halifax. While passing through Moncton, Sky raised some grub money by singing in the streets. He was arrested once again. The Moncton police released him to continue tramping to Halifax. After another night in jail in Kingston, N.B., he wandered into New Glasgow, where he was promptly arrested and thrown in jail. In Amherst, a farmer reported Beals for stealing one of his cows. Beals denied the charge but still spent a night in jail. The judge ordered Beals out of Amherst and instructed the town to provide train fare back to Halifax. Weeks after being abandoned in New Brunswick, Beals finally arrived back in Dartmouth. Shortly after his return, Beals hurled a stone at some boys who were teasing him on Portland Street. He missed. The stone smashed the window of Conrad's butcher shop, likely earning Beals another night in jail. Nevertheless, for the smiling man named Sky, there was still no place like home. Bruce MacNab is a journeyman carpenter from Dartmouth who has taught apprenticeship and communications at NSCC.